Until we investigated, NIWA’s web site did not disclose that the temperature readings had been adjusted. We only found out when we went to graph the data they provided – our graph was wildly different from theirs and showed no warming. For years, NIWA scientists even refused polite requests from our scientists to disclose the adjustments they had made to enable independent review of their results. As our frustration grew, Coalition members and the CCG in 2009 published their landmark review Are we feeling warmer yet, showing the difference between the raw and adjusted readings, and began publicly to criticise NIWA’s reluctance to release official public data. That made four principal objectives. What’s their status? Reconstruction: as we know, it’s finished. Peer reviews: NIWA and the BoM say that a single peer review occurred. NIWA claims their report has been approved; the BoM describes a somewhat cursory examination. There’s no evidence of the BoM’s approval and no sign of a thorough examination. There’s no evidence of other peer reviews. Formal paper: not submitted, unpublished. In summary: three out of four objectives were not achieved. That is not adequate and I note that no explanation has been offered. It’s certainly not what the Minister promised the Parliament. After the announcement of the review, nothing happened for several months, so the Coalition issued Judicial Review proceedings. About six weeks later, NIWA sent station records to the BoM showing their proposed adjustments. After some to-and-fro, NIWA received a final report from the BoM (excluding Hokitika) in early December. NIWA didn’t like it a bit. They first sent off an interim reply and then gave the BoM a 40-page broadside on the eve of Christmas. The BoM didn’t respond. So NIWA made the best of it. They published a report on the ‘Review of NIWA’s “Seven-Station” Temperature Series’ on 16 December, 2010, with its new temperature record (NZT7). The report included a wishy-washy letter from the BoM confirming it had carried out a peer review, but saying nothing significant about the outcome. In the global climate change debate, much reliance is placed by some, such as the IPCC, on allowing only peer-reviewed material, in an attempt to ensure good quality information. There is also enormous public interest in our suit against NIWA, both here and overseas. Recognising this, I asked NIWA for copies of their correspondence under the Official Information Act. I’ve previously described the outcome in NIWA’s review taking a hiding, NIWA’s review: what are they hiding? and NIWA — show us the peer review! The Ombudsmen’s office warned of possible delays in January 2011. They later asked for comment on NIWA’s claim for legal privilege on the grounds that the whole peer-review had been undertaken as a defence to our legal proceedings. My first request related to the period up to publication of the Review. In July 2011, I lodged a further request for the period subsequent to the Review. I finally received “no” for an answer just a few weeks ago, in July. Independently, Warwick Hughes asked the BoM for copies of the correspondence under the Australian Freedom of Information Act. His experience was described in What are the Aussies hiding, No, really — what are they hiding, Some questions for the BoM’s FOI executive and other posts. The Coalition’s legal advisers sought Court-supervised discovery and inspection of the BoM peer-review papers. NIWA’s advisers fought this tooth and nail. After about eight months of constant delays, the parties settled the discovery dispute on a basis which left out the BoM papers. NIWA now goes so far as to claim that climate science exchanges between public agencies (both subject to Freedom of Information statutes) are too secret to be seen by this Court. This claim has no credibility, and I invite the Court to draw an adverse inference from NIWA’s obstructive behaviour. The obvious inference is that the BoM found NIWA’s unprecedented methodology to be fatally flawed. As the defects remain undisclosed, it would be dangerous for this Court to accept NIWA’s unsupported opinions on any of the scientific matters in dispute. [The extract shown above] says that NIWA will “rely on evidence prepared specifically for the purpose of this litigation”, presumably referring to the affidavit of Kevin Trenberth. It is notable that Dr Trenberth makes no attempt whatever to analyse or justify any of the Review Adjustments. NIWA’s failure to obtain validation from any external source reinforces the adverse inference already mentioned. 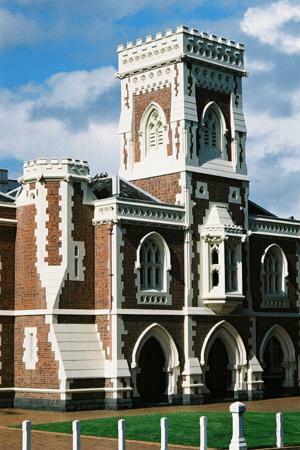 The High Court as it is now after extensive restoration 20 years ago. This was a very different outcome than was promised by Minister Mapp. Now the Review outcomes are no more than NIWA’s in-house opinion. The Review techniques were self-invented, and have no precedent anywhere in the world. BoM apparently didn’t like them. Trenberth wasn’t prepared to vouch for NIWA’s detailed methods or results. No other expert witnesses were found to support them. Although relying upon Rhoades & Salinger (1993) (RS93) in every chapter of the Review, the Wratt affidavit finally admits that the RS93 statistical techniques were not used in the Review. The departure from RS93 is not mentioned in the 174-page Review report. There’s no explanation for abandoning the internationally-recognised methods in the Review, in the Court documents or anywhere else. Nearly 20 months ago, the Review stated that NIWA was still in the process of calculating the confidence levels of the adjustments, as promised by the Minister in February 2010. But they were not produced for the hearing. NIWA says they will be recorded in the promised journal paper. Yes, Val, I bet you are! And I’m excited to bring it to you! I’m right now writing a brief post announcing that permission to view the documents has been granted, but access must wait for the decision. I’ll answer your questions in that. It’s a mixture of yes and no. I was fascinated to read what he has to say. He writes well. Should be spiking the site traffic. and NIWA scientists have addressed the feedback from peer reviewers and have produced final versions of the reports for all the stations making up the seven stations series. True. There certainly was no documentary evidence, because, as the post makes clear, NIWA explicitly withheld it to “safeguard” the precious peer review process. The court must rely on his affidavit alone. Odd, as you say, since NIWA knew that every other assertion in the hundreds of pages of assertions had to be supported by properly-produced paper. So if NIWA cannot rely on BOM’s work as evidential support in law, what does this say about BOM’s Review and why can’t NIWA rely on it in law? This Bureau of Meteorology peer review of the National Institute of Water & Atmospheric Research Ltd (NIWA) “seven station” series is a scientific review of the station reports for the Auckland, Wellington, Dunedin, Nelson, Lincoln (‘Christchurch’) and Masterton sites as provided by NIWA to the Australian Bureau of Meteorology. In this context ‘scientific review’ means a critical inspection/examination of the station reports taking into account the range of supporting evidence provided. The ideas, methods and conclusions of the papers are assessed for scientific error, internal consistency, clarity and scientific logic. The data and methodology provided in the reports from NIWA are taken as an accurate representation of the actual analyses undertaken. We are not in a position to question all of the underlying analyses and data that have contributed to the final results, such as methods used to compile raw data taken at stations. We do, however, perform some independent analyses as appropriate to the aims of the review as outlined above. The review does not constitute a reanalysis of the New Zealand ‘seven station’ temperature record. Such a reanalysis would be required to independently determine the sensitivity of, for example, New Zealand temperature trends to the choice of the underlying network, or the analysis methodology. Such a task would require full access to the raw and modified temperature data and metadata, and would be a major scientific undertaking. As such, the review will constrain itself to comment on the appropriateness of the methods used to undertake the ‘seven station’ temperature analysis, in accordance with the level of the information supplied. In general, the evidence provided by NIWA supports the homogeneity corrections that have been applied to the temperature record to create the ‘seven station’ series. The scientific papers clearly report on major issues which have been identified in the metadata and past scientific literature. It is also clear that a number of significant adjustments (as identified by NIWA in the reports) are clearly required for the raw/composite station series owing to inhomogeneities which would otherwise artificially bias results. So basically, NIWA realized that its approach was deficient in light of the more rigourous statistically verified approach undertaken by NZCSC, rendering BOM’s Review of no consequence. Kudos to Bob D, Gary K (? ), Barry B, 3 wise men (statisticians) and who ever else compiled the NSCSET Audit for exposing NIWA’s scientific deficiency in this case. Richard don’t know if that letter formed part of NIWA’s case, did it? Absolutely. Also, Bob reminded me the other day that without Warwick Hughes the task of analysing NIWA’s adjustments was a hopeless one. He gave us a spreadsheet given to him several years before by Jim Salinger that showed the actual adjustments made to the raw readings, though it didn’t show why they were made. Val, it certainly provided some fuel, though I can’t quote specific statements we made. It must have helped counsel to conclude the BoM gave the review no support. I see you’ve found the audit at the CSC site. It’s also available here. That’s right. Warwick was the key to everything – without him we could never have resolved the 7SS into each station component, and worked out the individual adjustments. NIWA weren’t prepared to give away any information at all. We now know the reason – they had no idea how Salinger arrived at each adjustment, and simply didn’t want to admit that the graph we were querying was as big a mystery to them as it was to us. Remember the nonsense about altitude adjustments at Kelburn using Wellington Airport? Yes. Eventually, it emerged that no adjustments anywhere in the country had been calculated on the basis of the station’s altitude. They were all made on the basis of neighbouring sites. The BoM does not enjoy a pristine reputation among many Australian skeptics. It seems likely to me that NIWA was happy to agree to review by BoM in the belief that they could expect to receive active support from that quarter. A pudding that is too rich for BoM might be very rich indeed. BOM’s perspective being the Audit, NIWA’s being the compilation. What idealogues like Perrot and Renowden don’t realize is that sceptics hone their case to ever greater fineness by the thought provocation that erroneous commentary such as Perrott’s produces. #3 by June 2011, a scientific paper describing NIWA’s methods would be submitted to an academic journal for publication, and would be subject to independent peer reviews. Techniques involved in developing the Australian Climate Observations Reference Network � Surface Air Temperature (ACORN-SAT) dataset. Note that BOM goes a step further than NIWA and adjusts out “weather dependent” inhomogeneities (“break points”). Apparently weather events and seasonal variations do not a temperature record make. But, but… it’s a record of the temperature! I’ve not heard of this. Why is a weather-caused step in the temperature record not part of that very temperature record? The 2nd -0.3 C Alice Springs Min step at 2001/02 is due to SITE MOVE (“a few metres west”). The NZCSET v NIWA case is essentially about (among other things) site move adjustments (as in the 2nd step above) but in the Australian situation, the site move adjustments can be secondary in magnitude to the weather adjustments (nearly 3x in that Alice Springs case). Absolutely correct, Richard. It was the discussion with Ken and your analyses that started me looking closely at the Masterton record using RS93. Ken, as usual, showed zero understanding of the issues. To be honest, I suspect he still doesn’t understand what’s going on, or how he prompted us. Gareth is the same, but isn’t a scientist, so I suppose he has that excuse. I laughed when I saw Gareth had given a summary of the court case. So getting back to motivation, thanks Ken, you were the catalyst that really got the Audit and court case moving. The homogenisation procedure detected a large number of relatively small shifts, in both directions, in minimum temperature at Alice Springs in the post-1974 period (Fig. 29). There was no significant site move at Alice Springs after 1974, but the shifts matched multi-year rainfall variations quite closely, with a tendency for higher minimum temperatures in the years following very dry periods and lower minimum temperatures in the years following very wet periods. Station photographs over the post-2000 period suggest that the height of vegetation (mostly grass) in the 100-200 metres around the immediate instrument enclosure varies considerably, being quite high during wet periods (e.g. immediately after the very wet 2000-2001 period) but almost non-existent after very dry years as occurred in the mid-2000s. A possible mechanism for this to affect minimum temperatures in the way observed would be for high grass to reduce screen-level wind speeds at the observation site, and therefore reduce mixing of the near-surface layer, reducing observed minimum temperatures (conversely, the absence of nearby vegetation would increase screen-level wind speeds and increase mixing of the near-surface layer). All over the world, rain makes grass grow, so naturally wind speed, near surface mixing and therefore temperature are modified but that is no reason to adjust out the change, rather it should be recorded as such because the record is of weather, seasons and climate IMO. This is quite different to say Albert Park where, as I understand, trees grew but they kept on growing. The Alice Springs grass on the other hand, grows when it rains, dries up when it doesn’t rain, grows again when it does and so on, that’s the nature of weather and grass – ask our dairy farmers about that. Even then, the -0.3 C site move step is at the lower limit of BOM’s ACORN step adjustments. They do NOT adjust for a step (break point) LESS than 0.3. Prior to that in the HQ series they had made 0.1 C adjustments. So if (hypothetically) the 2nd Alice Springs Min site move step at 2001/02 had worked out at -0.29 C, they would not have made an adjustment and the only adjustment this century would have been the weather adjustment at 2004/05. One of my “to do’s” is to get a better understanding of that process (it’s certainly clear enough) but I confess that at present I haven’t got down to the nitty gritty,.but I’ll keep at it from time to time. Having worked with professional engineers, architects, law practitioners and such like, I learnt to recognize the boundary of my technical ability and from then on to defer to relevant expertise. I think perhaps NIWA (and climate science generally) should learn to do the same. BTW, made an interesting discovery recently. Anyone in New Zealand can provide legal information as long as they don’t encroach upon the “reserved areas of law” as described in s6 of the Lawyers and Conveyancers Act 2006 (LCA), which covers the provision of advice in relation to the direction or management of legal proceedings. and don’t hold themselves out as something they are not e.g. qualified in law. I’ve always wondered what the limits were because I’ve been in the position to advise on council plan changes (and have done so by contract) but never knew the bounds in respect to Acts and Regulations even though I’ve had to have a working knowledge of several – now I do. This could be useful in regard to the RMA (and perhaps the ETS).where in the RMA, conflicts can be resolved and agreements reached via mediation and independent hearing without needing to go to court. I’ve just counted 8 R&S adjustments in the ‘Statistical Audit’ that were less than 0.3 C.
Using BOM’s ACORN-SAT criteria, those adjustments would NOT have been made e.g. there would be NO adjustments to Auckland (0.00, +0,02, -0.12, 0.00, R&S cumulative sum for Auckland -0.1, NIWA -0.62). That is, BOM ACORN-SAT criteria makes even less site move step adjustments (after R&S application) than the R&S criteria does. Richard … just in respect to what you say NIWA’s minister (the Hon. Dr Wayne Mapp) added three further undertakings …. Note the careful wording: “NIWA scientists have addressed the feedback …..”. Nothing here to suggest that NIWA accepted or adopted that feedback. Truly magnificent work, and kudos to all. I have been peripherally watching the progress of this litigation, and the result thus far is incredible. That’s good stuff Richard. Interesting.